The French side ran in seven tries to end Cardiff Blues’ season. Macalou runs in one of his two tries. 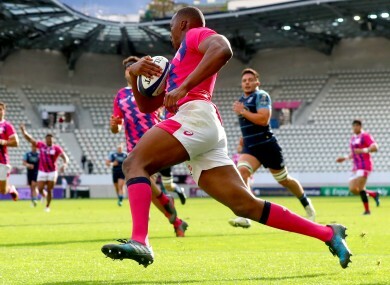 CHALLENGE CUP CHAMPIONS Stade Francais took a step closer to next season’s Champions Cup with seven tries and a 46 – 21 win over Cardiff Blues. Both of these teams would have qualified under the new rules set in place for next season’s qualification process — Stade as Challenge Cup winners and the Blues as the Pro12′s seventh-placed team — but they were left to duke it out in the first of this weekend’s play-off semi-finals this evening. Stade will travel to either the Sportsground or Franklin’s Gardens next Friday for a qualification play-off final with Connacht in England to take on Northampton tomorrow. Two tries in three first-half minutes gave the Blues the upper hand and a helpful 3 – 14 lead with tries from Macauley Cook and Nick Williams. However, the home side mounted their comeback eight minutes from the interval, Waisea Vuidarvuwalu crossing and Morne Steyne converting to leave the deficit at just 10 – 14 at half-time. The third quarter belonged to the hosts however, with Giorgi Melikidze, Mathieu De Giovanni and Sekou Macalou all touching down by the time an hour had elapsed. Suddenly, Cardiff were facing the end of their season and a scoreboard that read 29 -14. Cook would grab his second try of the match minutes later, and Gareth Anscombe his third conversion, but Stade remained in the ascendancy with Macalou grabbing a second before Laurent Panis and Clement Daguin hammered in the final nails. Email “Stade Francais await Connacht (or Saints) in play-off decider after crushing Cardiff Blues”. Feedback on “Stade Francais await Connacht (or Saints) in play-off decider after crushing Cardiff Blues”.